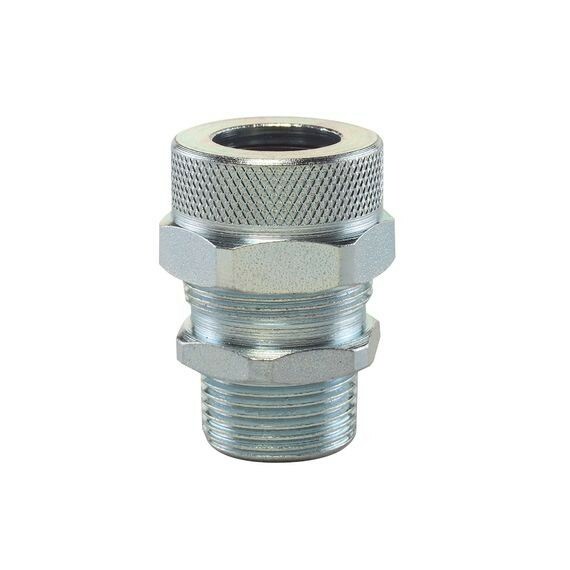 Remke Tuff-Seal Steel Cord Connectors feature a body and compression nut made of zinc-chromium plated steel for added strength and durability, enhanced resistance to rust and a better physical appearance. These connectors are ideally suited for use in washdowns or high moisture environments in food processing plants, petrochemical facilities, wastewater treatment plants, pulp & paper mills and chemical manufacturing factories. These Steel Cord Connectors have been designed to withstand the extremes of water, caustic materials, detergents or survactants. They can be ordered with or without wire mesh and accommodate 3/8”, ½”, ¾”, 1", 1 1/4", and 1 1/2" conduit. The combination tightening surface on these connectors is a unique Remke design that provides a large wrenching area of easy installation. And the knurl section offers users an extra gripping surface for initial hand tightening.